Enclosed 3000m2. Possibility of sleeping 10 people. Fully equipped kitchen. Outdoor gas grill. Possibility to rent for a weekend except July and August. + The house is lovely and fully equipped with everything you need and lovely clean bedding . The view and outdoor space and pool is fantastic. 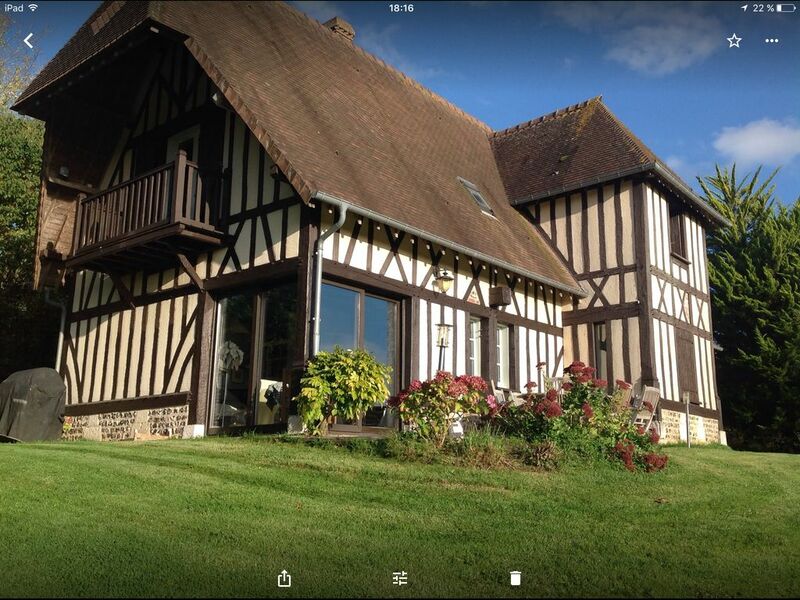 It is situated near the little town of Houlgate which is lovely with a beautiful sandy beach . - The mattresses were a little uncomfortable on some of the beds. Overall we had a lovely holiday there and would recommend it. We just passed two weeks in Gonneville-sur-Mer and really loved it. The house is very nice and well equipped with everything you need. The bedrooms are comfortable. The pool is heated (27 degree Celsius) so we used it every day even with bad weather which was especially nice for the children. The terrace is beautyfull and offers a wonderfull view over the whole valley. There is a gas grill which we used frequentely. The owner are very nice and helpful. The location is perfect to visit every part of Normandy. The sandy beaches in Houlgate and Cabourg are nearby (10 minutes by car). Very recommandable!!! Thank you very much and it was a pleasure to meet you. Très belle maison, spacieuse, bien équipée et située dans un très bel endroit calme (belle vue). Propriétaire très avenante. Repas au soleil sur la terrasse plein sud fin octobre, le top! Je prends bonne note du commentaire de notre locataire. J'ai fait changer l'ensemble de la literie fatiguée ainsi que le micro-onde, bien qu'il soit de très bonne qualité, grand volume et à programmation tactile. Toutefois, je refuse le qualificatif d'"usé" pour le mobilier. D'autre part, aux vues des photos, on peut constater que le terrain n'est pas "très" incliné. le locataire aurait pu également signaler que la maison lui a été confiée dans un état de propreté irréprochable. Ce qui n'a pas été le cas lors de son départ et lui a été signifié.